One evening a very dimumitive (and very young) drummer of local notoriety came to the stage at a Southampton gig with a proposition, dump the rhythm guitarist and the drummer and Martin (Cuddles) Smith would join us along with this crazy (and broke) keyboard player friend, called Roger, from a previous band. We struggled for ages for a Group name (a stupid one of course because that’s what you did then – heard of the Moby Plums!) We gave up. During a rehearsal in the basement of a local pub (the Black Dog Club, which we ran for a while) we found our name. The Landlord, looking at our longish hair concluded that we looked like a bunch of Medieval serfs - sneering as he got through the EVIL bit. That’s it! THE MEDDYEVILS (with me being arty it was written meddyEVILS to keep the Landlord happy). Our first date as the meddyEVILS was on Saturday June 6th 1964 at the Bannister Ballroom Southampton. My diary says 'went down a bomb'! BIG TIME here we come. 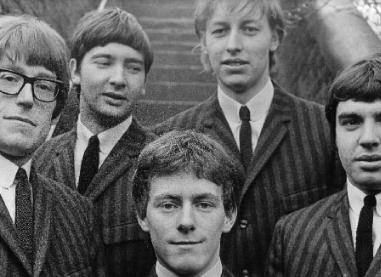 Avenue Artists in Southampton (I think they still exist) signed us up along with Dave Dee, Dozy, Beaky, Mick and Titch, Rod Stewart (yes him) and the Soul Agents and Les Fleur de Lys. Soon we were touring with the big boys all over the place. Tiredness and sleeping at work (because we drove all night!) meant that we had to become a PRO BAND in January 1965. Almost exactly one year from our first gig we were asked to Audition for a recording contract. 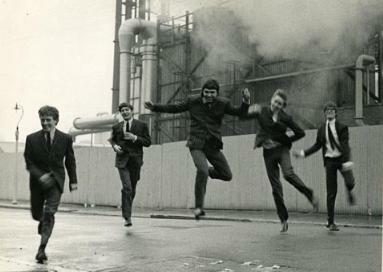 A whiz up to PYE Studios at Marble Arch and an audition with TONY HATCH (Wednesday 2nd June 1965) clinched our record deal (confirmed Friday June 11th 1965) at about the same moment that our organist went totally insane and left. More money to share around they said. A lot more work for the remaining guitarist I said. To fill the gap I learnt to play the saxophone (a tenor … hear it on 'Place called Love') – remembering those clarinets from my Uncle Bert – I got to play quite well very quickly (about three weeks! ), by practicing in the group van at the back with a duster stuffed down the end!